This is about the RSI Indicator and how it can be used to influence your option trading decisions. The RSI is a "momentum indicator" and as such, is mainly used to confirm whether a trend is likely to continue or whether it is running out of steam - i.e. losing momentum. If you're a trend trader this makes it important. The RSI is also known as a "leading indicator" (as opposed to a "lagging indicator") which means that it provides a signal that alerts us that a possible change of trend may be in the wind, before it occurs. Finally, it is also called an "oscillator" because its signal bounces, or oscillates, between the two extreme points of +100 and -100. When it breaches 70 at either end it warns us that the security may be "over-bought" or "over-sold" as the case may be. You should be very wary of entering a trade that is based on the asumption that the trend will continue when the RSI is hovering around these extremes. This is the primary purpose of the RSI indicator - to warn you that price action is possibly losing momentum. Where UP = the average of the upward closing changes over the selected period, and DOWN = the average of the downward closing changes over the selected period. 1. Start with the closing prices for the last 14 days 2. Where the closing price of the security increased from the previous day, total the amounts of these increases. Divide this by 14 to arrive at the average UP closing prices. 3. Do the same thing for the days where the closing price is lower than the day before. This gives us the average DOWN closing price. 4. Divide the average UP closing change by the average DOWN closing change to get the relative strength. 5. Add 1 to this number. 6. Then divide the number from point 5 by 100. 7. Subtract this figure from 100. You've just calculated the RSI! But why bother going to all this trouble when just about any charting program you can find these days will do it for you and present it as a graph. The RSI fluctuates between 0 and 100 in the form of a line chart which rises and falls. We can divided the RSI display into regions by drawing horizontal lines - one at 70 percent and the other at 30 percent, to indicate the warning zones. Some also include a line at 50 percent. It's important not to confuse the terms "over-bought" and "over-sold" as meaning that too many shares have been bought or sold so that buyers or sellers (as the case may be) are about to re-enter the market. This is not the case. It is all about momentum and momentum alone. It is simply a warning that the momentum of price action may not last so that the trend you are relying on is in danger of either decreasing or possibly even reversing. Have a look at this chart and note the RSI. What Signals Does the RSI Indicator Give Us? The RSI serves a dual purpose. Firstly, its current level in combination with the trend warns us if momentum may be failing because the stock is "over-bought" or "over-sold". The second use relates to divergences. An RSI that rises up through the oversold line (30%) after falling below it is considered bullish. An RSI falling back through the overbought line (70%) after being above it is considered bearish. When the RSI trend and the price action trend of the stock are in opposite directions there is a high probability of a potential change in trend. It is important to note that the RSI won't tell you when the change will occur, or how strong it will be, only that it may be coming. 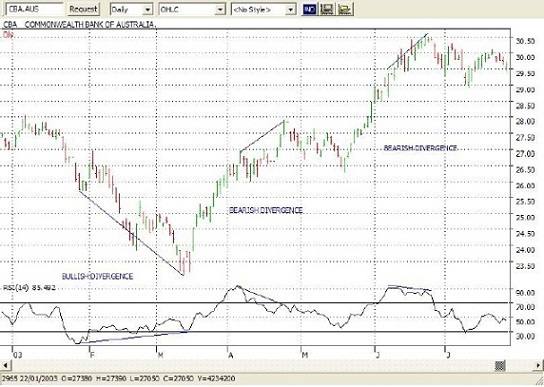 A bullish divergence occurs when the stock falls to lower lows, but the RSI makes a higher low. The stock appears to be weak but in fact, is gaining strength and preparing for a reversal. 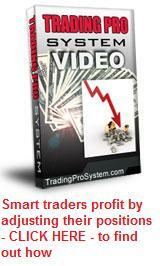 Wait for validation then buy your call options when the stock begins to reverse. A bearish divergence occurs when the stock rises to higher highs, but the RSI makes a lower high. The stock trend may appear to be strong but the indicator tells us it may be weakening and preparing to fall. Again, wait for confirmation before buying put options. 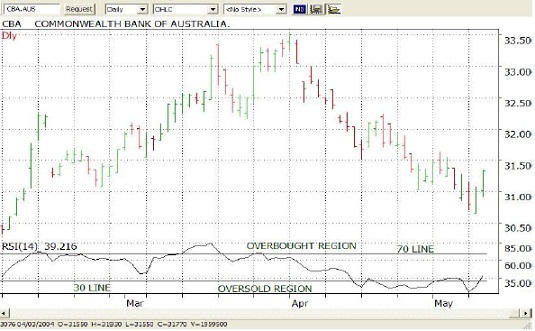 Take a look at the chart below for examples of RSI divergence. The RSI indicator is one tool you should always pay attention to if you trade options with the trend.